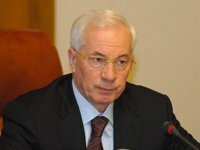 Organizing the search for gas and oil and other mineral deposits is a key task of the Ecology and Natural Resources Ministry of Ukraine, Ukrainian Premier Mykola Azarov said while introducing the newly appointed Ecology and Natural Resources Minister Eduard Stavytsky in Kyiv on Monday. "The issue of the search for and production of resources, first of all refers to natural gas, oil, and other mineral deposits, [and it] is very important to us. We have to carry out a great deal of work from the viewpoint of drawing investments to this sphere, as well as finding serious partners," he said. According to Azarov, Mykola Zlochevsky, who earlier held the post of the ecology and natural resources minister, will significantly improve activities in this direction in the National Security and Defense Council. The premier also noted that Zlochevsky played an important role in the resumption of Ukraine's participation in international trade by Assigned Amount Units within the frames of the Kyoto Protocol. As reported, on April 20 Zlochevsky was dismissed from the post of Ecology and Natural Resources Minister and appointed as the deputy secretary of the National Security and Defense Council. Meanwhile, Eduard Stavytsky was dismissed from the post of the head of State Service for Geology and Mineral Resources and appointed as Ecology and Natural Resources Minister. As reported, Yanukovych appointed Zlochevsky as Ecology and Natural Resources Minister on December 10, 2010. Before this, he held the post of Environmental Protection Minister, and earlier he headed the State Committee of Ukraine for State Material Reserve. President Yanukovych appointed Stavytsky as the head of State Service for Geology and Mineral Resources on December 29, 2010. Before that, from February 2007 Stavytsky chaired the board of National JSC Nadra Ukrainy. After the change in the government he was dismissed from the post in late January 2008, but in late March 2010 the cabinet returned him to this position.